We’d love your help. 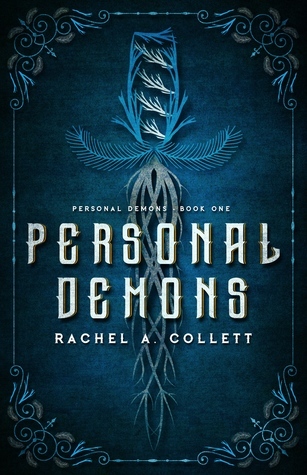 Let us know what’s wrong with this preview of Personal Demons by Rachel A. Collett. Deadly with a knife and skilled in hand-to-hand combat, nineteen-year-old Sarah Mathis is far from normal, despite her efforts to be so. Trained from youth to battle the paranoid imaginations of her father, she pushes into society after a lifetime of isolation, only to learn that a supernatural adversary wants her hidden… or dead. I received a digital review copy from Xpresso Book Tours in exchange for an honest review. My opinion is in no way influenced by the author, publisher, or distributor. When I was 13, I wrote a book. It was basically just a copy of the Vampire Diaries, but I thought it was excellent at the time, with brooding attractive bad boys, and a boring, quick to overreaction brunette protagonist. I didn't try to get it published though. I didn't write a trilogy. I realized that my crappy, cliché story was j I received a digital review copy from Xpresso Book Tours in exchange for an honest review. My opinion is in no way influenced by the author, publisher, or distributor. When I was 13, I wrote a book. It was basically just a copy of the Vampire Diaries, but I thought it was excellent at the time, with brooding attractive bad boys, and a boring, quick to overreaction brunette protagonist. I didn't try to get it published though. I didn't write a trilogy. I realized that my crappy, cliché story was just that: crappy and cliché. Personal Demons is a book in which Sarah Mathis, a knockoff Elena Gilbert, meets a lot of very attractive brooding bad boys who all either want to get into her pants or protect her, or both as the case may be. Her story begins right after her best friend (her only friend really) dies in a car accident. Literally at her best friend's funeral, she's spewing exposition. Dead boy Ian's friend Benjamin was in the car too, and is now in a coma. On her way to visit him in the hospital, she sees a hot stranger and "[takes] a moment to appreciate his strong jawline, high cheek bones, and remarkably straight nose". What the heck? This hot stranger is a demon, her ~personal demon~ #RollCredits named Jonathan who was honestly just a discount Damon Salvatore. Good ole Ben turns out to be a stalker who was obsessed with her and is also 6 years older than her but doesn't even address this, and she doesn't mind. Besides these boys, there's Aaron, the mysterious Nice Guy™ deus ex machina who shows up every once in a while to save the day. Also, there's Laith, one of her other two friends who is overly protective and territorial of her in front of his own girlfriend, Elisa, an Alice Cullen wannabe. Sarah's dad, an abusive strong guy, forced her to travel around her whole life, homeschooling her (which apparently made her ~weird~ even though I know a lot of people who homeschool, and they're just fine socially and all that). Also, her dead mom is named Rachel (self insert much?) And don't forget Darius, who's a mile high and he's the scariest (Bad Lip Reading, anyone?) All jokes aside, once Darius was introduced, all personality Laith had was replaced with a copy of Darius's tough guy act. Cheryl, though, Ian's mom, was sweet, albeit a little grandmotherly for a 30 something year old who is supposedly "hot". The plot was all over the place and the characters were really annoying. Sarah, for instance, is supposedly this kind and caring person, but she overreacts every single time anything happens, and finds joy in beating people up and taking trophies like a serial killer does (granted, the situation in which that occurs called for a beat up, but her reaction was a little strange). The writing was really terrible. Around the middle, I actually got kinda invested in the story, but once I stopped reading, it was difficult to get back in. Collett has a problem of over-writing; EVERYTHING was explained. I have a brain. I can draw logical conclusions. I can figure out what he meant by saying that thing or what she meant by doing that. I don't need you to tell me what he meant. To correct this without actually correcting it, she would sometimes skip time and explain what happened instead of, idk, writing what happened. "We've decided it's time you started hanging with us more." Like, did the great council vote in my favor or something? You can imply things, Collett. You don't have to spell out people's intentions. Just say they wanna hang out. Also, where the heck is all this money coming from? She has a single dad who works odd jobs, no job herself, and is going to college. Later on, she does discuss this, coming to no clear conclusion, but literally everyone she knows is disgustingly well off. Smh. 3.5 stars, but subject to change (rounded down. Stewed). I received an eARC from Xpresso Book Tours. This in no way impacts my opinion and I make this review of my own volition. First, the blurb was on point. 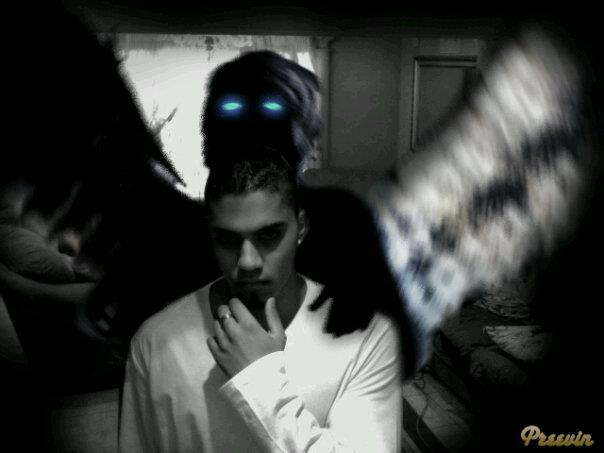 Personal demons being both mental demons and tangible ones? I loved the cleverness because even the physical demons could be mental ones if she ends up having a mental disorder, so double cleverness. Sadly I was the only one with that idea. Sighs. The character starts out interesting, but soon it seems that lust is a big player here as some things that don't make much sense to me occur and water down her character cough puns. The other characters kind of blend into each other as well. I liked the disappearing acts, not gonna lie, but sometimes it felt like things were a little too forced and convenient. However, I enjoyed the magic in some ways. There were bits and pieces that just came and made the book a little better, a little more interesting like the disappearing and reappearing, the fights were nice to read, and the interactions with the unknown was intriguing from time to time. Overall, there were spots that I got bored at, spots like fighting scenes and the figuring out how things were spiraling out of control that I wanted to read more of, but it was an okay book all in all. Personal Demons, by author Rachel A. Collett, is the first installment in the author's Personal Demons trilogy. As the story opens, 19-year old protagonist Sarah Mathis has suffered a devastating loss of someone who was the first person to ever love Sarah outside of her parents. She has two friends, Laith and Elisa, who she has the same course in college with. What makes Sarah different? She has very vivid dreams. Dreams that have attracted the attention of a character named Jonathan who seems to be everywhere she goes. I've never read an angel vs. demon book before, so I wasn't sure what to expect, but I enjoyed this one. The author does a great job creating characters and letting the reader into the main character's mind and emotional state. I felt connected to the main character, and I was on the journey right along with her. Oh my gosh l loved. Every time I read it I notice something new. I loved this book. It kept me engaged the entire time. I was asking questions left and right trying to figure it out. I usually can predict down to the T what will happen. I liked the real consequences that happen in the book. I definitely wanted more! And I'm glad she is doing a sequel. Now for the good parts, there are plenty of engaging characters, and the overarching plotlines show a studied skill in story telling. It was like being lead through a strange town by an elderly guide who had been away the region for many years. While there was no certainty where we were going the authors confi Not bad at all! Awesome book! Couldn't put it down. So interesting can't wait to see what happens next. Great very enjoyable read! action and left me wanting more! CAN'T wait till the next one! when is it coming out? Sarah has never fit in, always moving place to place with no friends, only her protective father to keep her company. So when she met and clicked with Ian, she finally knew what she was missing- that is until he was taken away from her in a car accident. Ian's death ended up causing Sarah to questions everything about her life, her life that has been full of secrets, lies and vivid dreams that seem more real than dream like. When Ian comes to visit her in a dream, he tells her that it is time fo Sarah has never fit in, always moving place to place with no friends, only her protective father to keep her company. So when she met and clicked with Ian, she finally knew what she was missing- that is until he was taken away from her in a car accident. ​Ian's death ended up causing Sarah to questions everything about her life, her life that has been full of secrets, lies and vivid dreams that seem more real than dream like. When Ian comes to visit her in a dream, he tells her that it is time for her to learn who she really is. I will admit that I pretty much had no idea what was going on, and sure, a good book can lure you in and do some world building along the way, but there needs to be a little bit more than that​ to keep me invested. There was pretty much no plot that I saw in the first 100 pages, just little hints of bread crumbs that the main character Sarah has lots of big, dark secrets in her past that even she doesn't know. I also had a hard time getting to know Sarah (except she has great taste in classic books) since it seemed like she did not really know herself either. The story did end up becoming more interesting in the second half of the 249 page book and completely unique to any other story that battles good vs. evil. But you just need to keep reading to get to it.